Jill Anne Gwinn, 66, found peace Sunday, March 31st, in her home from complications of her COPD. Jill will be forever remembered by her daughter Wendi Zagorski and husband Nickolas, daughter Catherine Mitten and husband Michael, and daughter Debra Dubiski; grandchildren, Alyssa, Nickolas, Hunter, Marcus, and Mia. 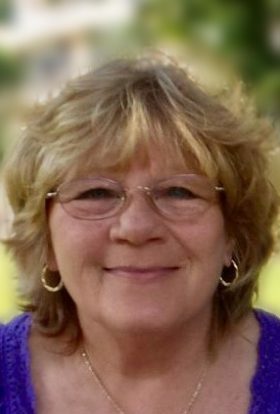 She will also be lovingly remembered by her sisters Joyce (Donald) Kunkel, Joan (Norbert) Repinski, Janet Clark, Jean (Michael) McCormick, and brother, Jeffrey (Linda) Nowak, nieces, nephews, and many friends. She will be terribly missed by her beloved canine companion Buddy. Jill was preceded in death by her husband Dennis Gwinn (2016), father Harold Nowak, mother Helen Nowak, brothers John Nowak and James (Jeannie) Nowak, sisters Judith (Michael) Koceja and Jo-Ellen Nowak. Jill enjoyed nothing more than to spend time with her family and friends. She received much joy from gardening and sitting out on her patio on warm sunny days. She will be remembered for her selflessness, compassion, heart of gold, and huge capacity to love. She had an amazing sense of humor with a smile and laugh that were truly infectious. A celebration of Jill’s life will take place on Thursday, April 11th, 2019, from 5:00 PM – 8:00 PM at The Elks Lodge located at 5555 West Good Hope Road, Milwaukee, WI 53223. Warm finger sandwiches, appetizers, soda, and coffee will be served. A special thank you to the anonymous donor for the generous monetary contribution to Jill’s memorial celebration. Your generosity during this extremely difficult time will forever be appreciated. Angels are not only in heaven but walk amongst us here on earth. My Dearest Aunt Jill, it still doesn’t seem real that you are gone. I know that you are at peace now but that doesn’t seem to make it easier to deal with. May your beautiful soul rest in peace and your beautiful smile, laugh, and warm heart, continue to live in everyone you knew when you were here. Love you Auntie Jill. My deepest sympathy to all of you fir the loss of your mother. Jill was a loving mother and grandmother . Her family was her life and you know she lives in each one of you. May God heal your broken hearts and remember she is watching over all of you. Sending love & light to the entire family during this difficult time. Aunt Jill will surely be missed! I was blessed to have her as a part of my life. Thank you Wendi, Cathi & Debbie for sharing your beautiful Mother with me.